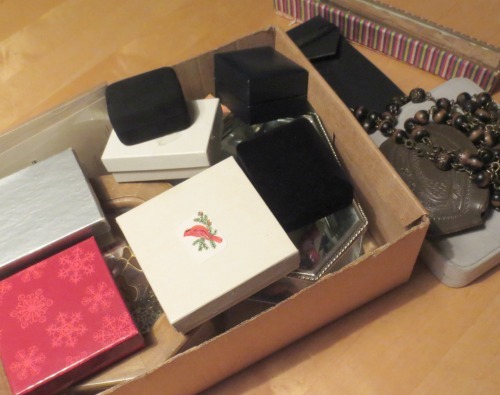 A Shoebox Full of Jewelry…What Will I Find?? Recently a friend (who works for nuns) said she had some things from a deceased nun that the organization was hoping to sell and was I interested in taking a look? You betcha! My friend and I met up and she let me take home a shoebox full of jewelry to sort through, research and make my decisions. Well, you know as soon as I got home I couldn’t resist diving into it! What was in all these little boxes? Well as expected some of it was junk, but at least half were nice things and one piece was old and exquisite. Here’s a mini showcase of what I found. As you can imagine a nun might have a number of crosses. The turquoise cross is marked 925 and signed JC, which could stand for Indian jewelry designer Jessie Claw. The rosary appears to be made of olive wood and is quite long. The cross with semi-precious stones is unmarked and may be silver plate rather than sterling. The old timepieces are kinda cool, but in non-working condition so I would have to sell them for repair or steampunk. Surprisingly, I found seven Italian vermeil necklaces. (Vermeil is 14K-24K gold applied over sterling silver at least 2.5 microns thick.) They are all quite attractive and very wearable. 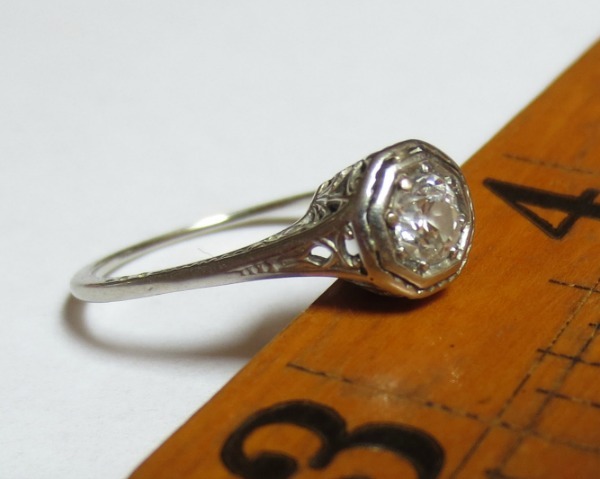 There were also a few rings, but my favorite, hands down, was an Edwardian-era 10K gold ring with a small (likely 1/3 carat) diamond. It came in a big jewelry case from Grebitus & Sons Jewelers, Sacramento, and looked real to me…but I did a knife test on a spare pearl in the box and it revealed a glass bead underneath…pooh! But it still is lovely. Better than most faux pearls I’ve seen. Cheap, plain beaded necklaces hold little charm for me. Same for cheap, modern earrings. And there are two cards of Lenox china pins that have never been worn that someone may like, but they just don’t intrigue me in the least. Always interesting to read your blog, Karen. I like buying box lots of jewelry from estate sales or at auctions. I love the antique pins as you know. 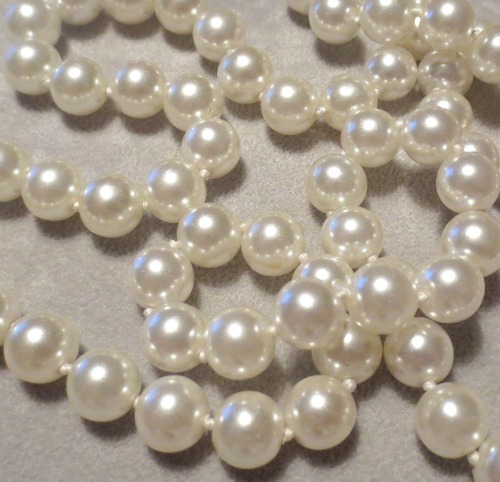 I enjoy a good quality old set of pearls too. I really love the quality of the work in old pins…something that is unheard of today.